Spring arrived pretty early this year or is it that Winter never came in the first place.? Ahhh. The evolution of the man where we are born to be playing with balls. As we grew old from young, we play bigger and bigger balls. From marbles to ping pong to squash to basketball. However, as we move even higher up the age ladder, our balls starts to shrink from football to tennis to golf. I guess by the time we are as old as ancient relics, we have only mothballs to play with then. Anyway, the weather was beautiful as the fog just lifted leaving behind lush greens and clear air. Temperature was at a nice 20+ degree Celsius. Cool enough not to break a sweat but yet warm enough to be clad in bermuda shorts. Also glad the Lunar New Year is almost over as the club staff have all disappeared into their corners. 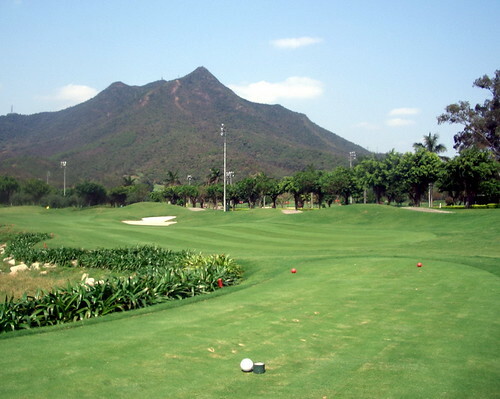 It was harrowing to be playing golf during the new year period when all the staff would suddenly appear with a cheery smile, wishing you a Happy New Year AND they will linger around and chat with you until you finally relent and give them a red packet to shoo them away. Suddenly the word Remoras jolts to minds when I think of them. Wiki that if you don't know what a remora is. 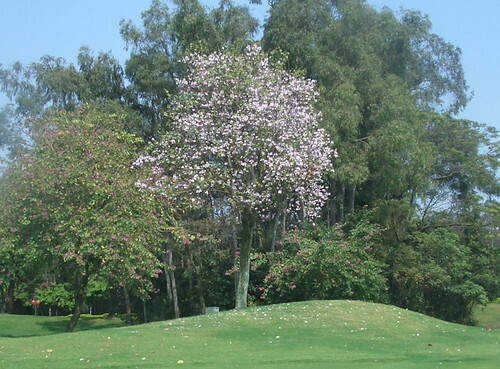 Then I reach the first hole of the West Course and I was stopped in my tracks by the presence of a very beautiful tree. It was a Cherry Blossom tree. Who says you need to goto Japan to see this? "Eh? Since when we have cherry blossom tree here?" I blurted. "It's been there since day one!" came the answer amongst the snickering caddies. Indeed it was there for more than a decade, judging from the size of the tree. I must have passed this tree for a thousand times over the years and it finally caught my eye in its full splendor. What did I say about slowing down and taking in the sights around you? P.S. Pictures were taken using a Casio Exilim Z30 (3.34 Megapixels) and seriously did not do justice to the photos. I can't wait to get back my Panasonic Lumix FX-7 from the service centre later this week.